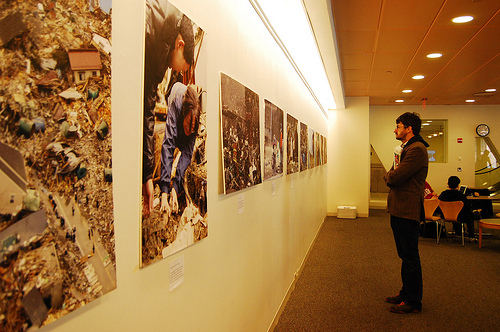 A visitor to the New York University Kimmel Center in Manhattan looks at photos April 15 of the aftermath of the March 11 earthquake and tsunami in Japan. Despite historical tensions between Japan and Korea, many U.S. Korean communities have joined fundraising campaigns to help earthquake victims. Photo by Kwanwoo Jun. After weeks of watching news reports on the earthquake and tsunami that struck Japan, Korean-American Jill Lee turned one of her social networking club gatherings into a fundraiser for survivors. Lee, 40, of Sunnyside, Queens, is one of many Korean-Americans since last month’s earthquake to put historical tensions aside and launch a fundraising campaign for Japan. “We can meet and greet but also raise money for Japan,” she wrote to club members in an email message. Thirty-three members, most of whom are Korean-Americans, gathered at a Japanese restaurant in Midtown April 2 for the fundraiser, which brought in more than $700. Before World War II, Japan colonized Korea for 35 years, banning Koreans from speaking their native language and forcing many to work in Japanese mines and factories. Tensions still exist today; the countries are locked in a territorial dispute over a chain of rocky islets—called Dokdo in Korea and Takeshima in Japan—and Korea often denounces Japan for approving history textbooks that gloss over the colonization. But relations between the groups, both in the U.S. and abroad, have shown signs of improvement since the quake. Nearly 350 Korean-American associations in New York and New Jersey have raised $216,000 as of April 8, according to the South Korean Consulate General in New York. In South Korea, T.V. 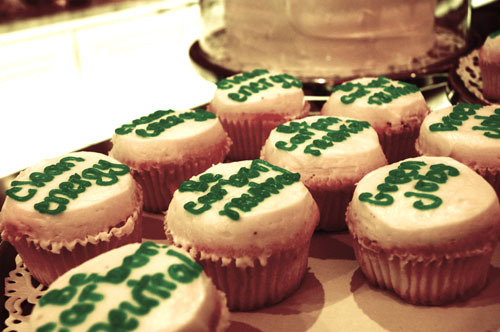 broadcast stations launched separate fundraising programs to lend support. Seoul’s top diplomat in New York welcomed the Korean community’s fundraising campaign. “This is a very good occasion to let them understand how much Koreans suffer from the past history, from the Japanese occupation and invasion,” South Korean Consul General to New York Young-mok Kim said, adding the tragedy in Japan is a good opportunity for the countries to make amends. Charles Armstrong, a history professor at Columbia University and expert in Northeast Asian affairs, said Korea-Japan relations were moving away from hostility. The Seoul government also sent 100 rescue workers to Japan three days after the earthquake, making South Korea the first nation to dispatch rescue teams. Great article Kwanwoo! I think you balanced both sides of the story really well–details about the fundraiser and the history of the relationship between Japan and Korea.